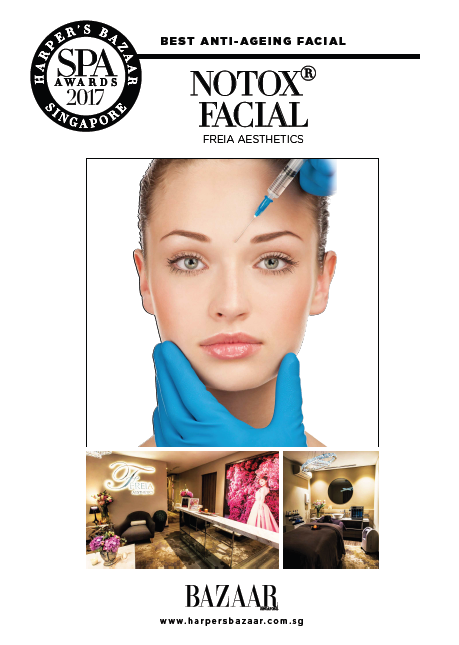 Our 90 min award-winning signature Notox facial delivers the instant benefits of a botox treatment without any side effects. This treatment was specially formulated in response to Dr Harold Ma’s clients who wanted the benefits of botox treatment for a wedding or important event in 2 to 3 days but who could not afford risking any post botox effects, as minimal as they may be. The epitome of luxurious facials; our Notox facial incorporates a potent 3-serum infusion; with its “star” serum containing lightweight Hyaluronic Acid and a powerful combination of Vitamins, antioxidants and an ingredient called Argireline. It is this ingredient that is responsible for soothing out expression lines and facial contours giving that instant no-needle botox effect, which typically lasts for a few weeks. The serums are delivered deep into the skin using our unique oxygen jet system. Beautifully combined with our other 2 serums (which are tailored according to skin types), the result is an instant lift, glow and restored natural radiance as you step out of our doors.